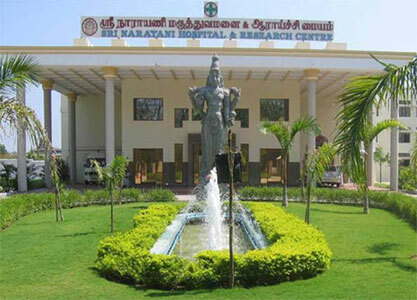 Sri Narayani Hospital & Research Centre is situated at Thirumalaikodi a tiny hamlet about 9 kilometers from Vellore. The prime object of its inception is to provide quality medical service to the less privileged rural population in par with the hospitals of metropolitan cities. Sri Narayani Hospital & Research Centre is a fully-equipped state-of-the-art hospital that gives considerable emphasis on patient care while reducing costs on treatment and improving accuracy and timelines. Sri Narayani Hospital & Research Centre is a 200 bed multi-specialty hospital and has a wide range of medical services. Casualty is having 7 beds and trauma care facilities like centralized oxygen supply, suction facilities and E.C.G. equipment which are readily available. This department is ready to deal with any type of emergency round the clock. Services of well qualified 3 Casualty Medical Officers and Nurses with excellent communication skills are at call for helping Surgeries like cranioplasty, craniotomy, spine surgery etc are carried out using high tech and latest equipment and instruments. Sri Sakthi Amma was born on the third of January, 1976, to Shri. Nanda Gopal and Smt. Jyothiamma. It was evident from birth that this baby was divine and very special. A distinct, divine ray of light (Namam) on the baby’s forehead was vividly visible, along with symbols of Chakra (wheel) and Shanka (conch) on either side of the chest.